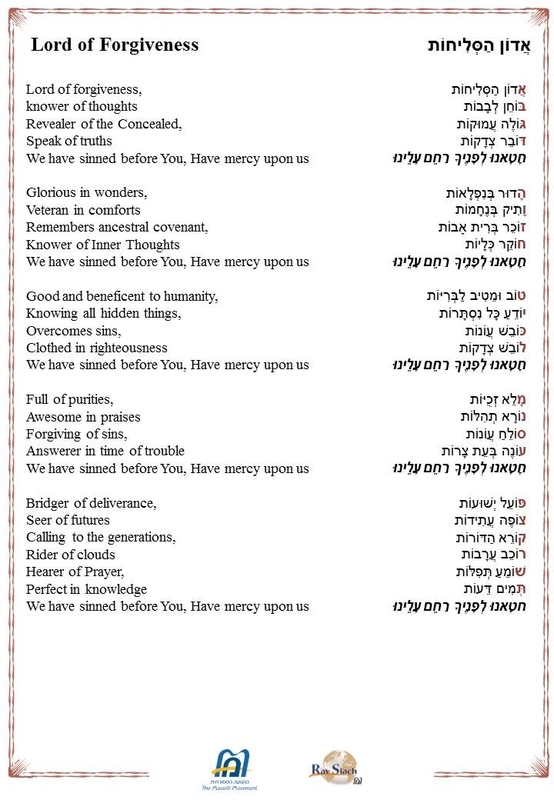 Adon HaSelichot is one of the oldest known piyutim, liturgical poems, in the canon of High Holiday prayers. In Sephardic communities, the piyut is at the center of the Selichot service, recited daily, besides Shabbat, from the 2nd day of Elul until after Yom Kippur. The piyut has become well known across the Jewish communities of Israel, and is sung in most synagogues, with melodies coming from Turkey, Morocco, and Ottoman-era Palestine, among others. The poem, written in acrostic form, focuses on God's omniscience and awareness of the sins and failings of every human. Despite this, we ask for God to have mercy on us, despite our various shortcomings.